Developed by iBiBo web private limited, 3 aka Teen Patti is one of the most popular Indian card game. It belongs to the same league as games like Solitaire, Bridge, Rummy, etc. This card game for Android, IOS phones, and tablets allows you to compete with people in your phone book contacts. The people with whom you want to play teen Patti game should install this app on their smartphone or the tablet. To improve your gaming skills, you can play interesting quizzes that can be run from the game settings. Well, this free card game for Android and IOS operating system sounds interesting, isn’t it? 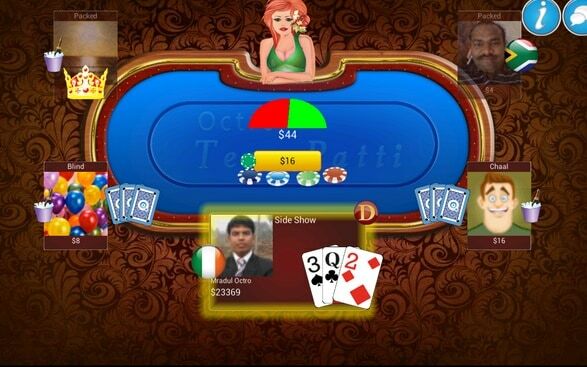 If you haven’t played this game yet, then it’s the right time to go ahead and install Teen Patti on your phone/tablet. Download link for Android or IOS device. Before you follow this tutorial, make sure that your computer is connected to the internet. The connection should be active till the game gets completely installed. Download bluestacks, the best Android app emulator in the world. Install the downloaded software and run it by double-clicking on Bluestacks desktop icon. Go to bluestacks search option and type Teen Patti. Once you type this word, kindly hit enter. Now you’ll be able to see this software’s icon as the bluestack search result. Double click on it and follow the instructions that the installer asks you to follow. Done! Now it’s the time to enjoy this free game. Follow step number 1 and 2 of the above tutorial. Go to Google and search for the teen Patti APK. Click on any of the relevant results that Google shows you. Download and save the APK file on your hard disk drive. Go to the folder where you’ve saved the APK file and right click on it. Follow step number 5 and 6 of the above tutorial. Good tutorial. Do you have any other trick to run this app on my laptop? i am die heart fan of this game and i was looking for free download it.I search lot and you stop me here,and its work.Thank you for sharing it.